Mike D'Antoni has maintained a pretty low profile since resigning from the post of head coach of the New York Knicks two months ago, on the heels of a six-game losing streak, the day before the NBA's trading deadline. While everyone else talked — about where the Knicks would turn next in their ceaseless search for a savior, about how the refusal to look inward for solutions has poisoned the Knicks' organizational culture, about whether D'Antoni really stepped down or a certain isolation-loving forward who never seemed at peace with the coach's spread pick-and-roll, ball-movement-dependent system demanded his ouster, etc. — D'Antoni just exited stage left, watched as the Knicks ripped off an 18-6 run under interim head coach Mike Woodson before being eliminated in the first round of the NBA playoffs by the Miami Heat, and kept quiet. Until now. D'Antoni recently sat down for a wide-ranging interview with legendary basketball scribe Jack McCallum of Sports Illustrated. McCallum spent a season in the coach's hip pocket while writing a pretty cool book about how D'Antoni was evolving the modern conception of NBA offense with the Phoenix Suns. In the resultant piece, D'Antoni shoots down rumors that he's interested in leading the Orlando Magic ("When I saw those stories, I immediately texted Stan [Van Gundy, the Magic coach] and told him it was bull----"), bristles over McCallum's description of his exit ("Could you use the word 'resign?' It hurts when I even hear the word 'quit'") and recalls his wife Laurel's response when he told her he was resigning ("She told me I should stop at the store on my way home because we were out of milk"). M.D. : I'm just not going to get into specifics. It came to the point that I had to resign, that's all. It was time. We weren't going anywhere and I was the coach. SI.com: All right, a theoretical question. You're a coach who likes an open floor, an active point guard, quick shots, pick-and-rolls, "dribble-ats," lots of movement. Carmelo is a post-up player who needs the ball and demands the ball. He's great but he kills the clock. Can that ever work? Was it doomed from the beginning? M.D. : Look, I've coached players who post up. Heck, Amar'e [Stoudemire, a Knicks forward] has been a post-up player. We used to post up Boris Diaw a lot in Phoenix. There are always things that can be done by mixing it up. Now, was it the best situation for my coaching philosophy? No. But there's never one answer for why things don't work out. [...] It got to the point where we had problems, we could not solve them, and an obstacle had to be removed. D'Antoni's right, of course. 'Melo's stubbornness in refusing to change his ball-stopping ways can't be understated, but there's also the coach's own inability to evolve his system to maximize the talents of his best player to consider. Plus owner James Dolan's obstinance in insisting on giving up half his roster to import a not-quite-elite superstar in the interest of having another big name to put on the marquee. Plus the myriad injuries and roster shakeups that fractured the Knicks' last two seasons into about a dozen different scattered short-term teams. And so on, and so on. SI.com: So you are still interested in coaching? M.D. : Yes. I'm not making a secret about that. I want to get back. But nothing is going on now, and the smart money says that I will hang out here [at his suburban home]. Michael [D'Antoni's son] will be a senior and to let him finish and graduate would be one good reason to stay here for a year. 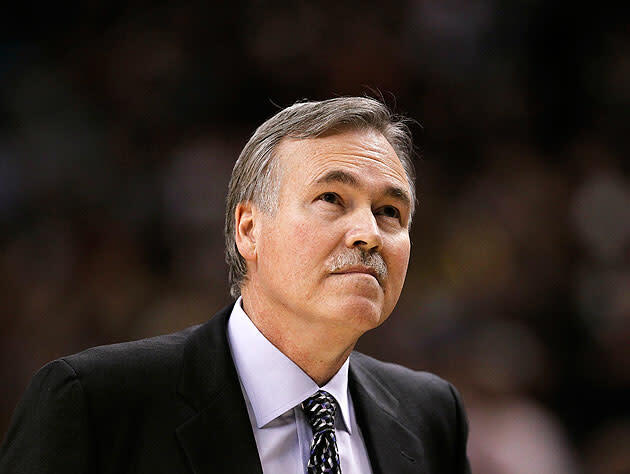 While D'Antoni's struggles in New York didn't exactly burnish his reputation, it's hard to imagine that it did enough to tarnish it to render him anything less than a hot commodity whenever he wants to come back to the sidelines, especially since a similar version of the offense he made famous in Phoenix and never got to fully implement in Gotham is currently carving up the Western Conference like a hot knife through butter. At this point, D'Antoni's return is just a matter of time, opportunity and roster construction. Teams with ball-stopping wings likely need not apply.